When Donna Cloutier remembers the earthquake, it’s the noise that she thinks of. It was 8:12 am on October 15, 2013, and Cloutier, an accountant at Courtenay’s Pateman & Company, was deep in the bowels of a hospital in Cebu City, Philippines. Eighty-five kilometres away a previously unknown fault-line had just slipped, causing a 7.2 magnitude earthquake. Along with a team of 21 doctors, nurses and non-medical volunteers, Cloutier had come to the Philippines to help perform cleft lip and palate surgeries to 100 children. The shaking lasted only 34 seconds, but months later aftershocks from the earthquake and the Rotoplast mission continue to reverberate for Cloutier. Through her membership with the Rotary Club of Courtenay, Cloutier heard about the work of Rotoplast International and its yearly missions to Cebu. A contraction of Rotary and plastic surgery, the 22-year-old charity gathers teams of doctors, nurses and other volunteers to travel to, mostly, Third World countries to perform cleft lip and palate surgeries. Linked to lack of nutrition in mothers, genetics and exposure to toxins during pregnancy, these deformities occur in one in 700 babies born worldwide. In North America it is generally quickly resolved after birth. In developing nations it is more common and because government-sponsored healthcare and insurance is non-existent, most families can’t afford corrective surgery. At best, kids grow up disfigured, get teased at school and often drop out before finishing high school. At worst, severe clefts can make it hard for children to eat and drink and absorb nutrients, leading to a host of health issues. Founded by San Francisco plastic surgeon Dr. Angelo Capozzi, Rotoplast partners with Rotary Clubs mostly in the US and Canada to fund missions to the tune of $80,000 each. The first Rotoplast missions went to Chile in 1992. Since then, about 200 missions have treated more than 15,000 children in 24 countries. Cloutier applied for a non-medical position on the 2013 Cebu mission and got accepted. Non-medical staff have to pay their own way and fundraise for the mission. Cloutier’s Courtenay Rotary Club kicked in $5,000. The Rotoplast team met at the airport before their flight to Manila with 21 boxes of supplies. “We brought everything we’d need except the bed and lights,” says Cloutier. Once in Cebu City they checked into a hotel and unpacked in their rooms on the 14th floor. 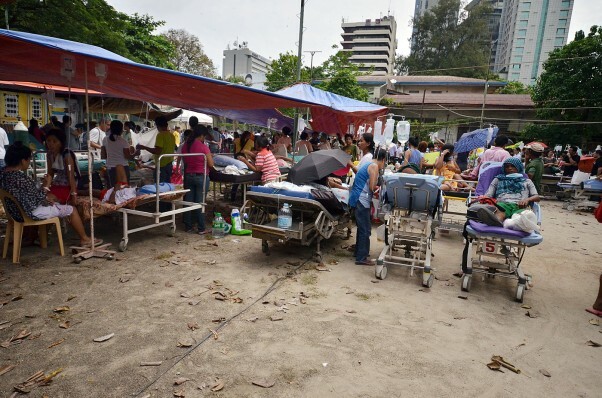 Medical personnel tried to make order out of the chaos after the earthquake in the Philippines, evacuating patients and closing up surgeries that were underway. The first day of any mission is assessment day. Weeks before the team arrives, a local Rotary Club advertises the coming clinic. They travel to remote villages and shanty towns to make sure the most vulnerable know about the opportunity. So on assessment day in Cebu City, 154 children with cleft issues and their families were patiently waiting outside the hospital. Some had travelled three hours to be there. The hopeful patients ranged from eight months to 18 years old and their clefts varied from minor to severe. The pediatricians and doctors assessed each child to make sure they were healthy enough for the two-to-three-hour surgery and to prioritize patients; over the seven day mission they only had time to do 100 surgeries. Some kids were given “I owe yous” for next year; the lucky ones were scheduled and some were rejected because they were too weak. Cloutier’s job was to sanitize the utensils for each surgery with an autoclave machine, which uses high temperature steam. A hurry up and wait sort of job, she had lots of down time. She brought her camera and spent a lot of time taking pictures, including before and after photos of the kids. On the first surgery day Cloutier arrived at 8 am. The three plastic surgeons, including Rotoplast founder Dr. Capozzi, were already halfway through the first two procedures. “They are the most humble, amazing doctors,” she says, noting that all three are respected plastic surgeons at the top of their professions at home. They begin each day at 6:30 and finish at 6:30 at night, 14 surgeries back-to-back, seven days in a row. “They know they have to do this. They know how important it is to the kids,” says Cloutier. This mission was Dr. Angelo’s 69th. Like a big assembly line, the mission is a model of efficiency. Pediatricians prep and assess the patients and bring them to the operating room where the anesthesiologist puts them under and intubates them. “They’re not supposed to eat or drink starting the night before, but most of them cheat,” says Cloutier. Two patients are operated on at a time, one dedicated plastic surgeon on each, a third floating between, and several nurses helping out. Once the procedure is finished, the patients are wheeled into the recovery room and two new patients are rolled in. In recovery the kids wake up pretty quickly and are assessed by the pediatrician. If everything looks good they spend another night in the hospital and go home the next day. The first two days went smoothly, with 14 surgeries each day. Cloutier was expecting the same on Tuesday, October 15, day four of the mission. She’d just sanitized her first set of tools for the day when the earthquake shook the room. She remembers watching an overhead beam wobbling back and forth. Moments later she was running for the exits along with everyone else. In the middle of a surgery, the operating room team ran out too. As soon as the shaking stopped, everyone ran back in to evacuate the patients. The doctors sutured up their partially completed cleft surgeries and wheeled the patients outside into an alley. Soon a nearby field and parking lot were full of beds and patients. Then the ambulances started to show up. Many of the injured were construction workers—their makeshift scaffolding of bamboo teetering four or five stories high had toppled. Others were dug out of collapsed buildings. “The building codes in the Philippines are not like ours,” says Cloutier. “If a project calls for 10 bags of concrete, the contractor will use six and take four home with him.” She guesses a similar intensity earthquake here would do far less damage and an even slightly more powerful one in the Philippines would have been far more destructive. After three hours in the sun and 30 degree temperatures, an engineer arrived at the hospital and condemned the area where the Rotoplast mission was working. With no room elsewhere in the hospital the team got their patients admitted and went back to their hotel. “I knew even before we got there, there was no way I was sleeping on the 14th floor,” Cloutier says. The hotel agreed to move everyone to a lower floor, but they’d still have to go to their rooms to pack their things. Cloutier’s room was a mess—tiles had fallen off the wall; the TV had jiggled itself across the room; dust was everywhere; cracks streaked the walls. Back in the lobby, another aftershock sent everyone running for the exits again. As she ran down a ramp toward the outside, Cloutier felt pain in her back. When they were finally allowed back in the hotel Cloutier could barely walk. She laid on a couch in the lobby; some slept outside. Most people slept in their running shoes so they’d be ready to evacuate at a moment’s notice. “I don’t think anyone actually slept that night,” she said. “I know I didn’t.” Aftershocks continued and she was in serious pain. The next day one of the doctors examined her, diagnosed a herniated disc in her spine and said the mission was over for her. She was devastated, but a dose of codeine for the pain soon lessened the heartache. Meanwhile, the Rotoplast team was back at the hospital working to find an operating room. No one wanted to go home. Later that afternoon their original operating area was declared safe and the team was back in action. They worked even harder than usual, completing all but 20 surgeries. By then Cloutier was back in Courtenay, lying in bed, having endured a painful flight home. Her husband Eddy Betinol had already booked the Native Sons Hall for an earthquake fundraiser. While Cebu took a beating, the epicentre of the quake and most of the damage was on Bentinol’s island of Bohol. Wikipedia reports that 222 people were killed, 976 injured and 73,000 structures were damaged, mostly on Bohol. That included the home of Betinol’s cousin and her five kids, which crumbled in the shaking. They moved into tents and tarps—not a huge hardship in the warm climate. But then one of the regular tropical storms swept through. Her small village clustered in the open church. Then things went from bad to worse. In early November, Super Typhoon Haiyan strengthened over the Pacific and charged toward the Philippines. “All I could think about is where is everyone going to find shelter?” Cloutier says. Bohol and Cebu were spared the worst of Haiyan, but still sustained more damage. The fundraiser ramped up with renewed interest and exposure. The night of entertainment, food and information raised $31,000 for Red Cross relief efforts. Four months later, Cloutier’s back is almost better, but the earthquake and the Rotoplast mission has touched her deeply. Weeks after returning she would wake up thinking she was feeling an aftershock only to realize it was Betinol rolling over in bed. “It affected me psychologically,” she says. But despite the scars, she’s determined to do more.